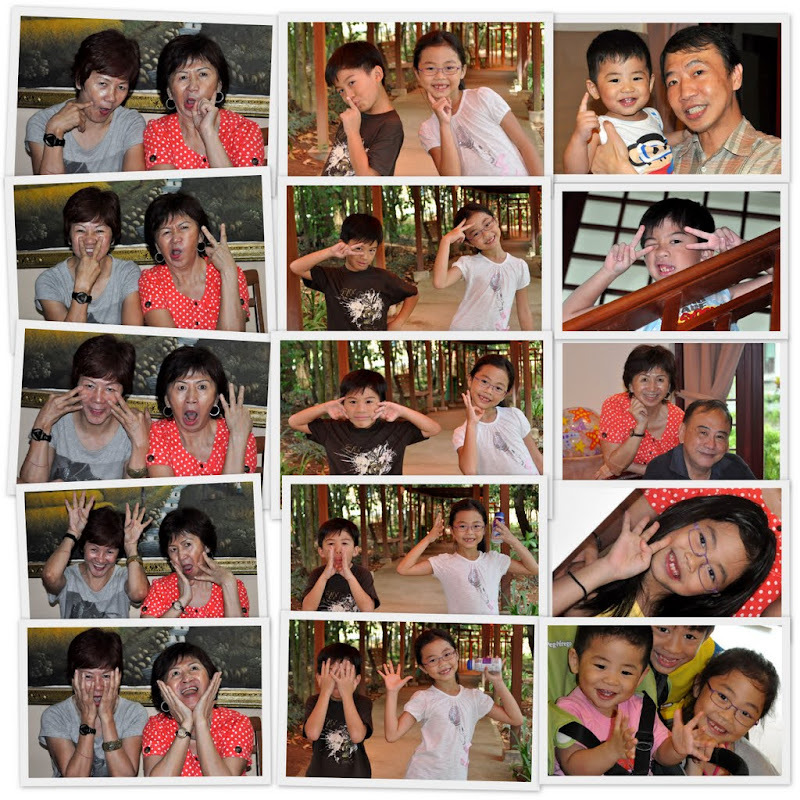 Last Saturday, my family took a ferry to Bintan in Indonesia. When we are there, we took an orange bus to the lobby to check in. While we are waiting, Qiqi and me were playing hide and seek. After checking in, a small little buggy that can fit five people, took us to our bungalow. My family stay in two different bungalows. It started to rain. My mummy blew a beach ball. We played the ball until dinner. Amy yi poh and Ah mah cooked dinner for the whole family. We had purple sweet potato porridge. There were scramble eggs, sardine, luncheon meat, veggies and chicken. After the dinner, I bathed and slept on the floor in a sleeping bag. I felt scared sleeping on the floor because I was worried there was cockroaches under the bed. So my mother let me sleep on the bed with poh poh. The next day, after breakfast, we went to the beach. I went deep into the sea. We found seashells, and dig small pools. After that, we went to the swimming pool. It was windy. Our beach ball flew into the pool and my mum tried to swim after it. But the ball flew away from the pool and went onto the ground. And I saved the ball’s life when I held it in my hands. We went home to bathe. We took a grey bus to Pasar Ole to eat lunch and shop around. Gugu bought ice cream for us. After that, a man helped us to do a tattoo on our legs. Qiqi had a Minnie Mouse, my mum had a butterfly, Gugu had a spiky fish and I had a rocket on my leg! We went back to our bungalow after that. We went to the club house to make masks and find more seashells at the beach. 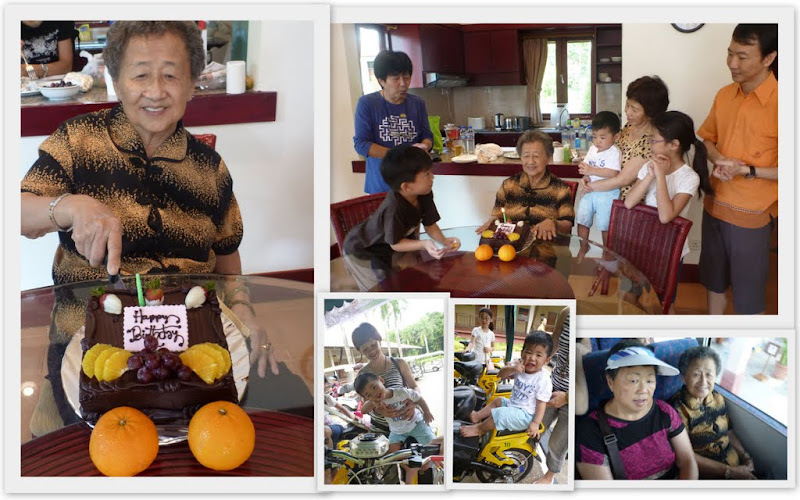 Amy yi poh, my mother, Qiqi and me went to buy some bread and a cake for my great grand mother. And we saw eight Iguanas in a big glass cage. We went back and had BBQ for dinner. We eat the chicken wing but it was not all cooked. There was hotdogs, grapes, noodle, veggies, pork chop and jelly. The noodle was the most tasty. The next morning, we went to the beach again. We walked to the forest side of the beach. And I saw a lot of dirty leaves from the sea. Then we walked back and jumped over some small rivers. We changed our tee shirts and ate lunch. Gugu bring us to a nice place. The driver drove us on a car with very big tyres and we splashed into the mud. It was exciting. After that we walked back to our bungalow and checked out. We took the ferry back to Singapore and took a cab back to Tampines! 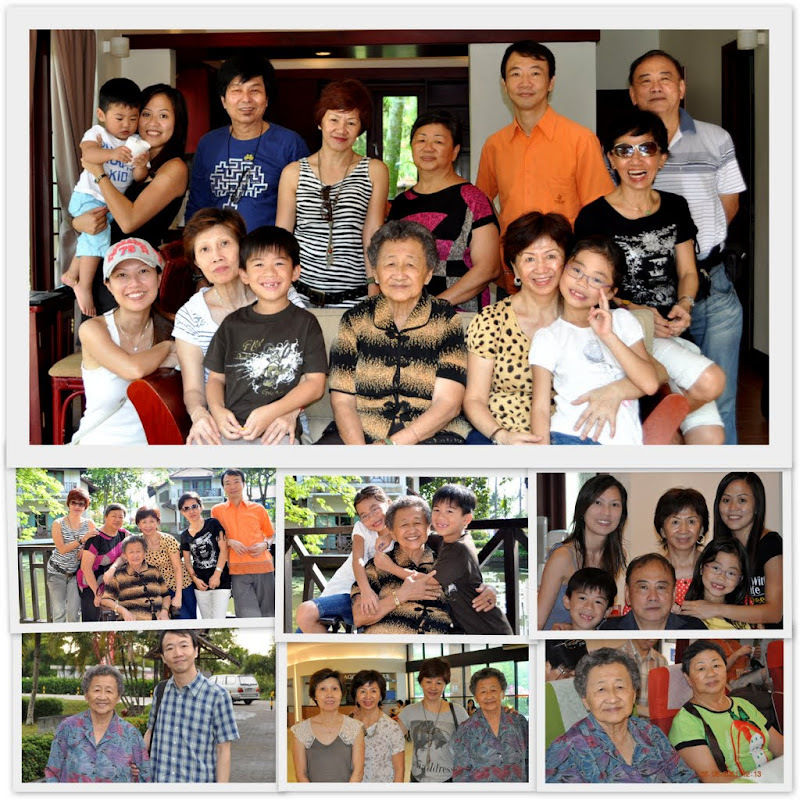 It was a big gathering of families from Singapore and Muar. We have four generations from great grand granny to great grandson! 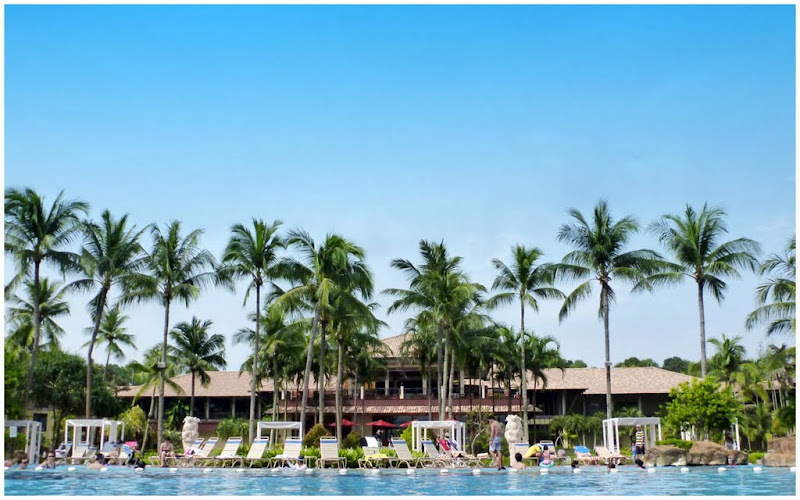 A one-hour ferry from Tenah Merah ferry terminal took us to Bintan Resorts. It was a smooth ride, unlike those ferry trips from HK to Macau or Zhuhai where Elkan pukes over Joe. We were greeted with sunny hot weather and lots of landscaped greenery. 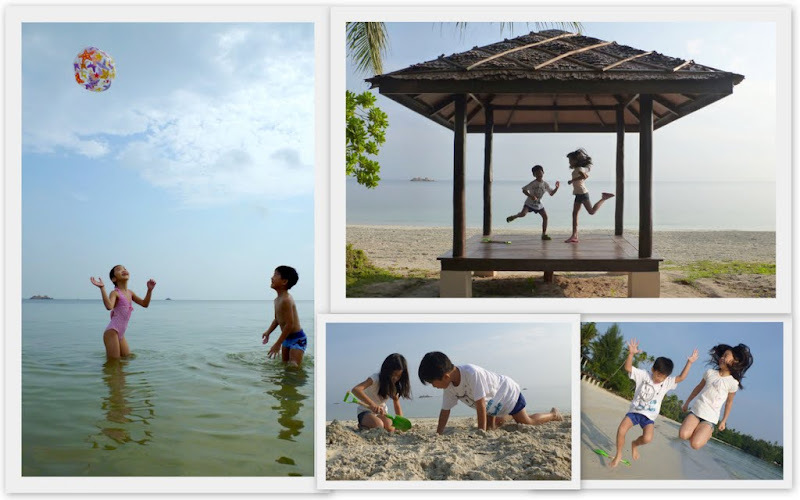 There were a few different resorts in Bintan. The Nirvana Suria bungalows we checked in were 2-stories with 3 spacious bedrooms on the second floor. And big fully equipped kitchen and living hall.In front of our bungalows was a big pond with water lilies and occasional sightings of a meter-long monitor lizards and small squirrels. Lots of beautiful flowers too. Unfortunately, it started to rain in the afternoon. So we stayed indoors while the kids were kicking a beach ball around and mummies and grannies are scolding them for making a din while baby Jorance was trying to get an afternoon nap. The rain continued. Our mums and aunts decided to cook dinner instead of dining out. 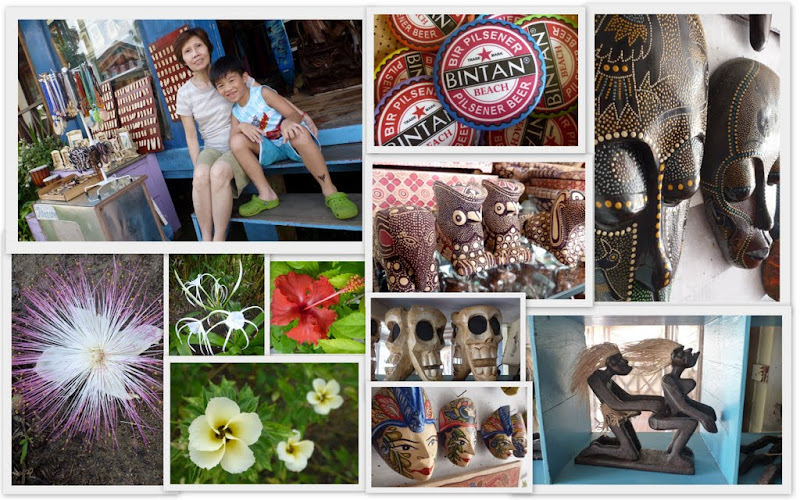 We found out that dining in Bintan was really expensive and all expenses are in Singapore dollars instead of Rupiah! This was not the usual travel light and easy trip. We loaded our luggage with lots of food! Our first dinner was simple dishes but was quite a spread! We had sweet potato porridge, canned vegetarian mushrooms, fried veggies, luncheon, stir fried chicken, sardines, steamed otah, fried eggs and fruits! After dinner was chatting and watching TV while the kids were running up and down the staircase and playing hide and seek in the big bungalow. It doesn’t take long before they were hungry and asking for supper. Qiqi and Elkan shared 3 packets of instant noodles before they were satisfied and head for bed. The next day, the kids were up early. As Bintan is an hour behind Singapore, and sunrise is much earlier, by 7am Singapore time, it was hot and sunny! The kids were bugging us to take them to the beach, so after a quick breakfast with sardine and bread toast, we headed out. The fine white sand was great! The shallow water stretched for quite a far distance into the sea. It was safe for the kids to roam around in the knee-high waters. Baby Jorance was enjoying every bit of it too. After less than 30 min, the scotching sun made us head for the cooler swimming pool instead. The pool was nicely shaped and sectioned for kids and adults under the shady coconut tress. 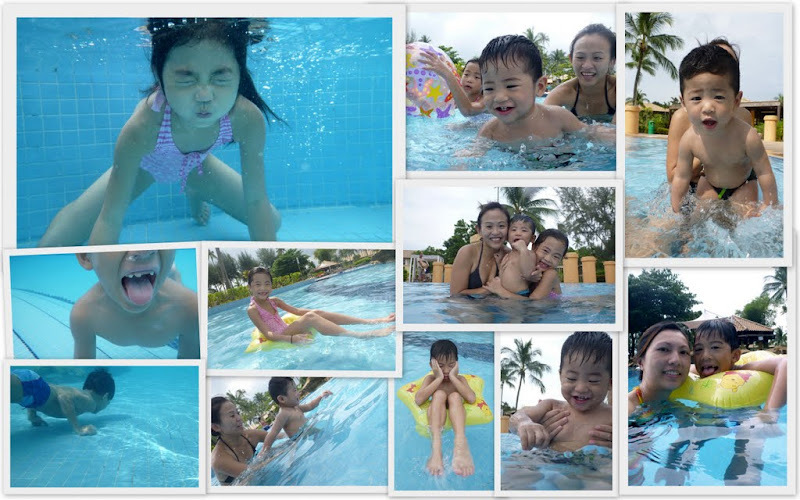 We had so much fun with the underwater camera! Lunch was great at Pasar Ole which was about 10-min coach ride to a small town. 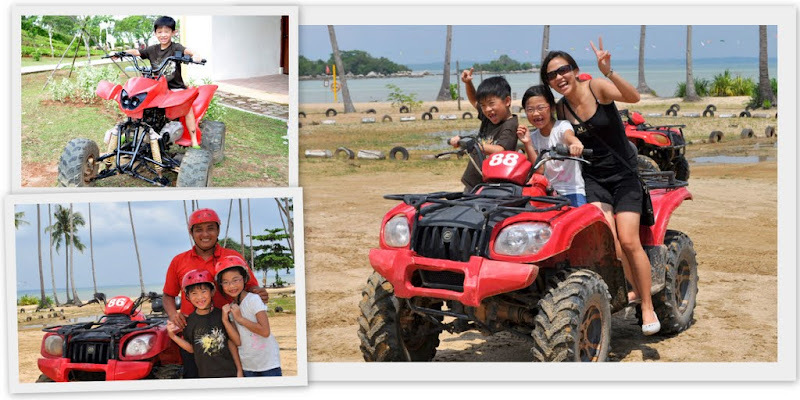 It was more like a tourist town for the guests of Bintan Resorts. A few restaurants and souvenir shops. I decided to do a little tattoo as I always wanted to but was worried about the needle and pain. But glad that this was a temporary one that last for only 2 weeks! It is similar to Henna but the colour looked like a real tattoo. Jovel, Qiqi and Elkan all picked a design and did a quick 5-min tattoo. 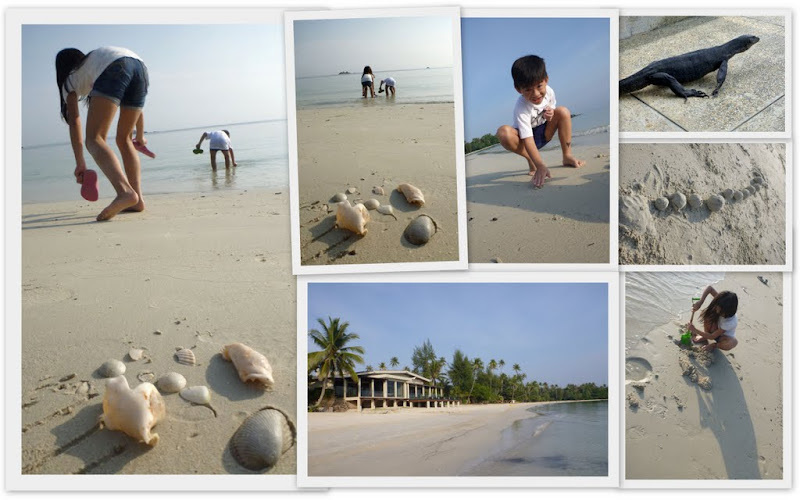 Jovel and me decided to send the two kids to the resort’s club house for a two-hour program where they are taken care of by the friendly staff to make face masks and pick seashells at the beach with other children. Back at the bungalow, our aunts called in masseurs for a one-hour pampering massage. While the uncles and dads laze at the balcony with peanuts and beers and updating stock market results from their laptops! And a nice view of bikini babes at the opposite bungalows from our balcony! I mean baby girls in bikinis lah…. Finally, we had our BBQ dinner! That emptied a few luggage! We brought our own chicken wings, pork chop, hotdogs, otah, sweet corns, sweet potatoes, seasoning, cup noodles, rice, papaya, bananas, dragon fruits, pineapple, lime juice, lots of biscuits, snacks, chocolates, teas, coffees, milos, disposable utensils and BBQ sauce. Amy Ah Yi brought 24 bottles of mineral water! We bought some eggs from the resort’s mini mart which cost 50 cents each! Some veggies were bought in the afternoon from Pasar Ole. Phew! That’s a lot of food! And it was a happy meal! Blurp…. Breakfast was great with Amy ah yi’s French toasts and scramble eggs. It was also a surprise breakfast for Ah Poh. We had a birthday cake for her. We wished her great health and lots of happiness. Really appreciate her traveling all the way from Muar to join us on this trip. It was rather tough for her especially during the long queues at the customs and ferry boarding. But she was all smiles through out with great spirit! Bravo Ah Poh!! All of us sang Happy Birthday in English and Chinese! Even baby Jorance was clapping his hands and enjoying it. I took the kids to the beach again for dig more holes and find more seashells. The morning sun warmed on our face as we took a long scroll to the other end of the beach which was more rocky and forested. We went back after an hour. Jovel took the kids out on the second adventure! The big monster 4-wheel drive! 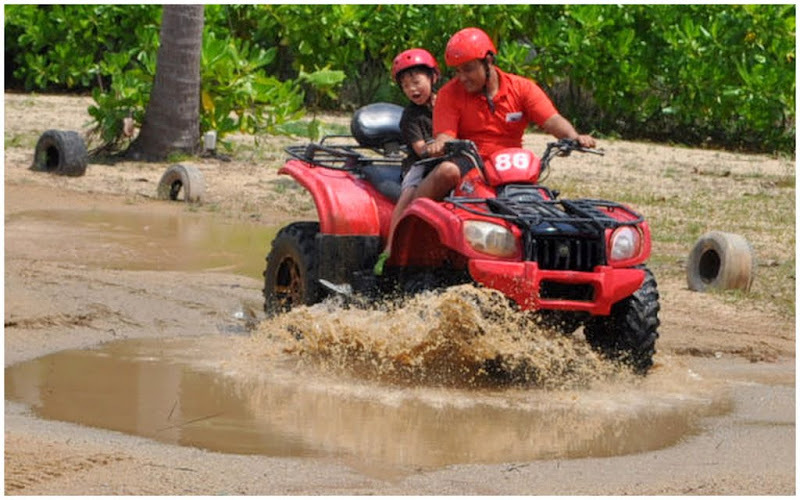 While Jovel drove one of the cars with Qiqi, Elkan had an experienced driver to drive him. In the beginning, Elkan was screaming and commanding his driver to slow down so that he doesn’t vomit. But soon, he was asking for more speed and bums! They were heading into mud splashes! After a short 10-15 min ride, they were thrilled and their faces tanned! Lucky driver escaped Elkan’s puke! Finally, we had to pack up and check out. We explored around the lobby and backyard, took more photographs before heading to the ferry terminal. Another smooth ride back and too soon we had to say goodbyes. Elkan asked if he could go back there again on the way back. He likes the beach and the sand! It was indeed a great trip. Most importantly, everyone enjoyed it. Would be great if the other boys, Leon, Chester and Joe were here. There would be mad fun! Looking forward to the next family gathering! yo my friend, you are a gifted writer… Loved your blog….